World Cup Model 8-12, automatic, 8 pocket, intermittent motion, stainless steel, rotary cup filler, pre-cut lid and heat sealer rated from 8 to 45 cups per minute – depending on materials and application Fill range: 1oz to 10 oz. Container size up to: 3.18" in Diameter with proper change parts. Equipped with 11" ID x 18" long stainless steel product hopper with agitator, 14-1/2" OD rotary turn table, has (8) 1-1/2"ID cup stations, cup magazine with pnuematic cup denester, single piston filler with 1-1/4" ID x 9" long piston and positive cut off nozzle, pre-cut foil lid magazine with single head pic n place, pneumatic heat sealing head and sweep arm reject. Control panel has machine, filler, foil, bottom up fill, jog, table and run on / off switches, with heat temperature controller and e-stop. Mounted on (4) leg stainless steel base frame with interlock safety doors and locking casters . 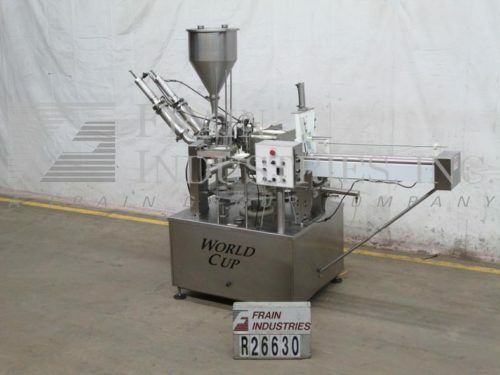 World Cup Model 12-32, automatic, 12 pocket rotary cup filler, sealer, lidder. Fill range: 1oz to 32 oz. Container size range: up to 4-3/4" in Diameter. 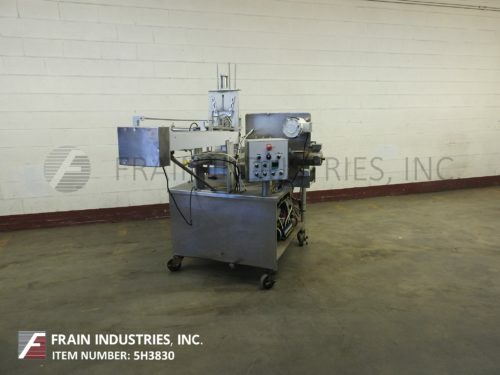 Equipped with 12 pocket 30" rotary turn table, roll stock film heat sealing station, 36" long roller lid magazine, lid applicator and sweep arm reject. Control panel has A/B PLC controller with dropper, heater, filler, bottom up fill, dropper, sealer, lidder and speed on / off switches and digital temperature controller, with variable speed control and e-stop. Mounted on stainless steel base frame. Change charts required to accommodate size ranges. 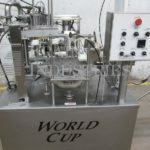 World Cup Model 8-12, automatic, 8 pocket, intermittent motion, stainless steel rotary cup filler, with pre-cut heat lid and sealer rated from 8 to 45 cups per minute – depending on materials and application. Fill range: 1oz to 10 oz. Container size up to: 3.18" in Diameter with proper change parts. Equipped with 10" ID x 16" long conical stainless steel product hopper with agitator,14-1/2" OD rotary turn table, with (8) 2-5/8" ID cup stations, cup magazine with pneumatic cup denester, piston filler with 2-1/4" ID x 5-1/2" long piston with positive cut off nozzle, pre-cut foil lid magazine, pneumatic heat sealing head and sweep arm reject. Control panel has machine, filler, foil, bottom-up fill, heat, table and jog, run, stop on / off switches, temperature controller and e-stop. Mounted on (4) leg stainless steel base with interlock safety doors and locking casters. World Cup, Model 8-12, 8 pocket, intermittent motion, stainless steel rotary cup filler with pre-cut heat sealer. Rated from 8 to 45 cups per minute – depending on materials, application and machine configuration. Fill range: 1 oz to 10 oz. Container size up to: 3.18" in Diameter. Change parts required to accommodate other size ranges. Equipped with 16" ID x 22" deep stainless steel product hopper, 14" OD rotary turn table, cup magazine with dual screw cup denester, piston filler, pre-cut foil lid magazine with single head pic n place, pneumatic heat sealing head and sweep arm reject. Control panel with fill, foil, heat, table and jog on / off switches, temperature controller and e-stop. Mounted on (4) leg stainless steel base with casters. World Cup Model 8-12 automatic, 8 pocket, intermittent motion, stainless steel rotary cup filler, pre-cut heat sealer rated from 8 to 45 cups per minute – depending on materials and application. Fill range: 1/4oz to 8oz. Container size up to: 3.18" Diameter. 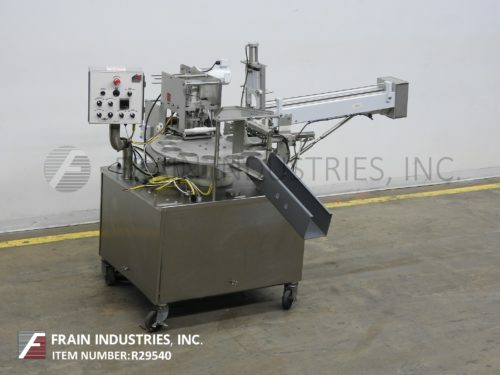 Equipped with 14-1/2" OD rotary turn table, 11" ID x 24" long product hopper, (4) cup rotary magazine with dual screw cup denester, PD filler, positive cut off nozzles, pre-cut foil lid magazine with pic n place, pneumatic heat sealing head and sweep arm reject A/B controller has control pane with fill, foil, heat, table and jog on / off switches with temperature controller and e-stop, mounted on stainless steel base with casters. World Cup, Model 12-32, automatic, 12- pocket, intermittent motion, stainless steel, rotary cup filler, roll stock film heat sealer and lidder. Fill range: 1oz to 40 oz. Container size up to: 4-1/2" Diameter. Equipped with 30" rotary turn table, 24" cup magazine with pull down cup denester, piston filler, positive cut off nozzle, bottom up fill, no container / no fill, roll stock film, pneumatic heat sealing head, lid applicator and sweep arm reject. Control panel has an AB controller with on/off switches for guard by pass, dropper, heater, filler, bottom up, sealer and lidder. Digital temperature controller, variable speed control dial and e-stop. World Cup, Model 8-80, automatic, 8-pocket, intermittent motion, stainless steel, rotary cup filler and roll stock film heat sealer. Fill range: up to 80 oz. Container size up to: 6.5" Diameter. Equipped with 30" rotary turn table, 16" ID x 22" deep product hopper, 24" cup magazine with screw cup denester, piston filler, positive cut off nozzles, roll-stock film, pneumatic heat sealing head, 40" long roller lid magazine, over lidder and sweep arm reject. A/B controller has control panel with fill, foil, heat, table, lidder and jog on / off switches with temperature controller and e-stop. World Cup Model 8-12, automatic, 8 pocket, intermittent motion, stainless steel rotary cup filler, and pre-cut heat sealer rated from 8 to 45 cups per minute – depending on materials and application. Fill range: 1oz to 10 oz. Container size up to: 3.18" in Diameter. Change parts required to accommodate size range. Equipped with 20" ID x 22" long stainless steel jacketed product hopper, 14-1/2" OD rotary turn table, cup magazine with dual screw cup denester, piston filler with 3" ID x 8-1/2" long piston with positive cut off nozzle, pre-cut foil lid magazine with single head pic n place, pneumatic heat sealing head and sweep arm reject. Control panel has A/B controller with fill, foil, heat, table and jog on / off switches, temperature controller and e-stop. Mounted on (4) leg stainless steel base with casters. Change parts required to accommodate different sizes.